Lessons in culture and creativity helped Riley Elementary School fifth-graders design paper sugar skulls to honor loved ones. Art teacher Rebecca Woods taught the grade level about Day of the Dead, or Dia de Muertos, a Mexican holiday celebration from Oct. 31 to Nov. 2. Students learned the multi-day holiday focused on gatherings of family and friends to pray for and remember loved ones who have died. The celebrations also support their spiritual journey. The fifth-graders learned about traditions associated with the holiday, including the building of private altars called ofrendas and honoring of the deceased using calaveras (skulls), marigolds and favorite foods and beverages of the departed. The loved ones’ graves were adorned with those gifts and visitors were able to leave possessions of the deceased at the grave. 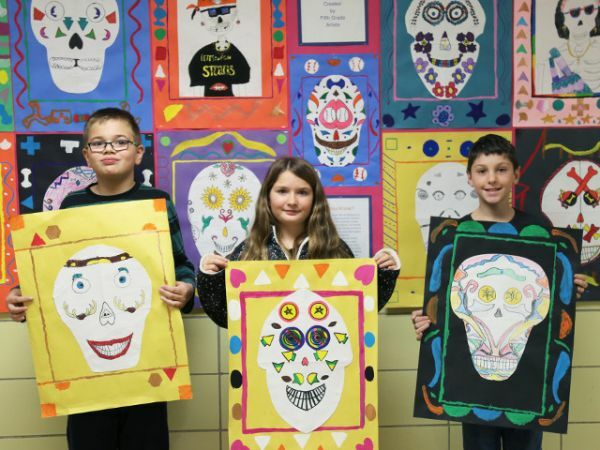 Woods said that upon understanding that history, the fifth-graders chose a family member or pet to honor through their artwork and created a sugar skill or la calaveras catrina as their subject. They drew symbols which represented their loved one on the skull or skeleton and focused on keeping all elements symmetrical. A background was created, framing their sugar skull or calaveras by painting colorful, symmetrical shapes and lines. With the project, students were able to deepen their understanding of the Mexican culture, learn how to use symmetry, line, shape and color in their artwork and make their own family connection.